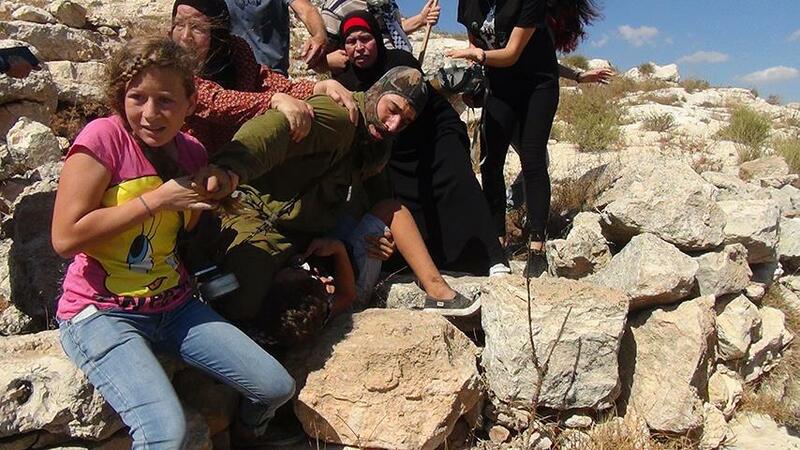 Both Israeli and International media have covered the incident in Nabi Saleh where an Israeli solider attacked and tried to kidnap a young Palestinian boy, only to be over powered by Palestinian women and girls from the village. 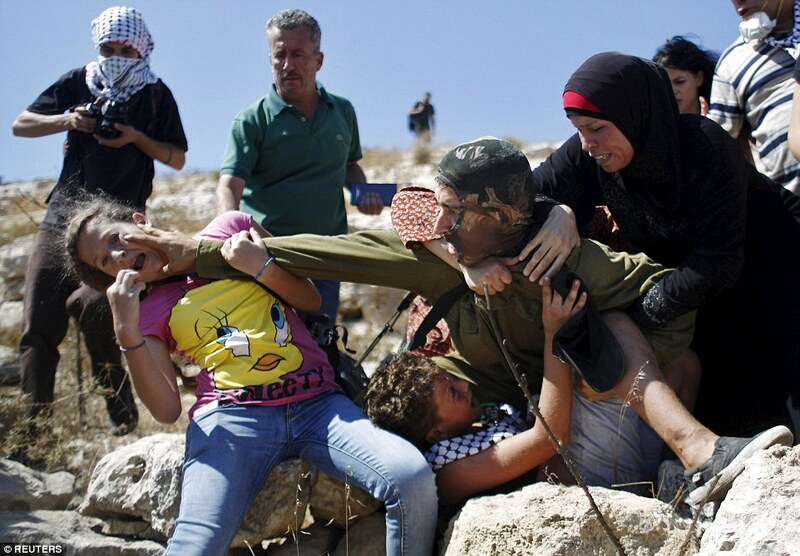 The women and girls succeeded in freeing the child, who had a broken arm and was being held in a headlock at gun point. 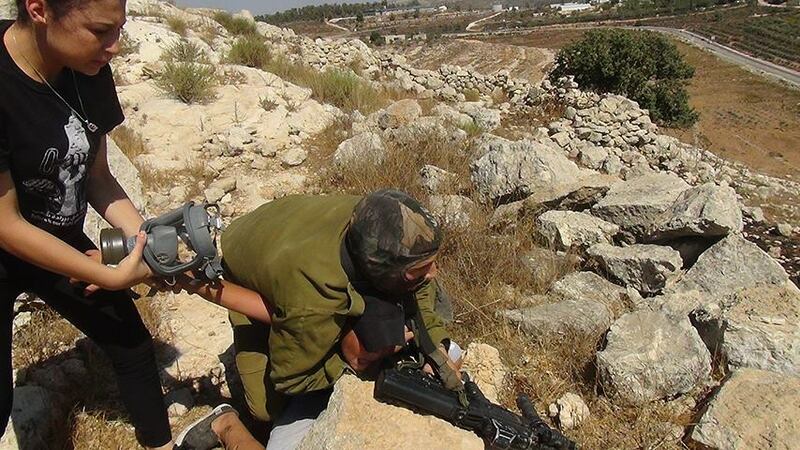 An 18 year old Palestinian youth was also arrested by the IOF on the day. 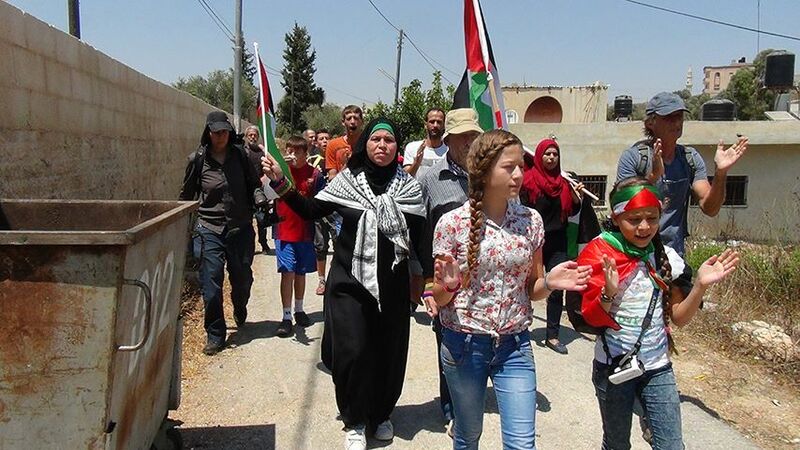 Activists at the protest in the West Bank village of Nabi Saleh say the soldier used violence against the 12-year-old boy. 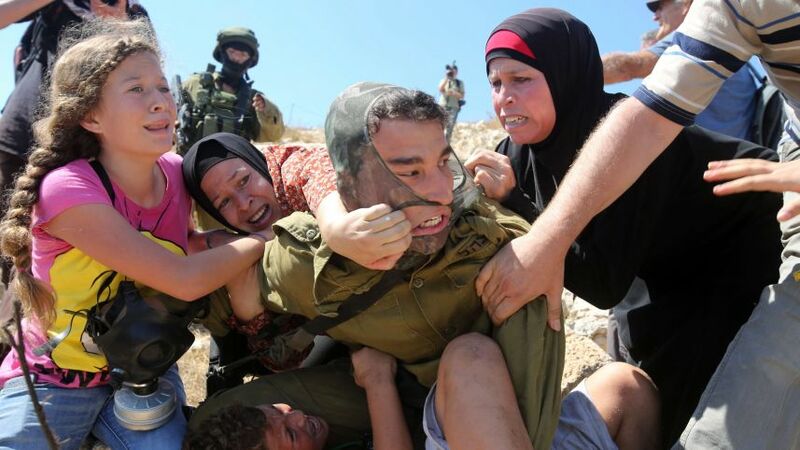 An Israeli soldier tried to detain a minor during clashes in the West Bank village of Nabi Saleh on Friday, but a number of Palestinian women and children managed to stop him. 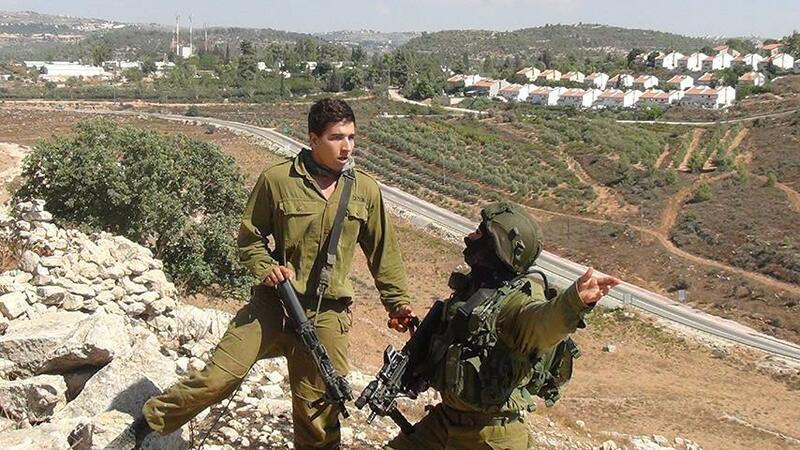 According to the army, the youth was throwing stones at the troops, who did not realize he was a minor. 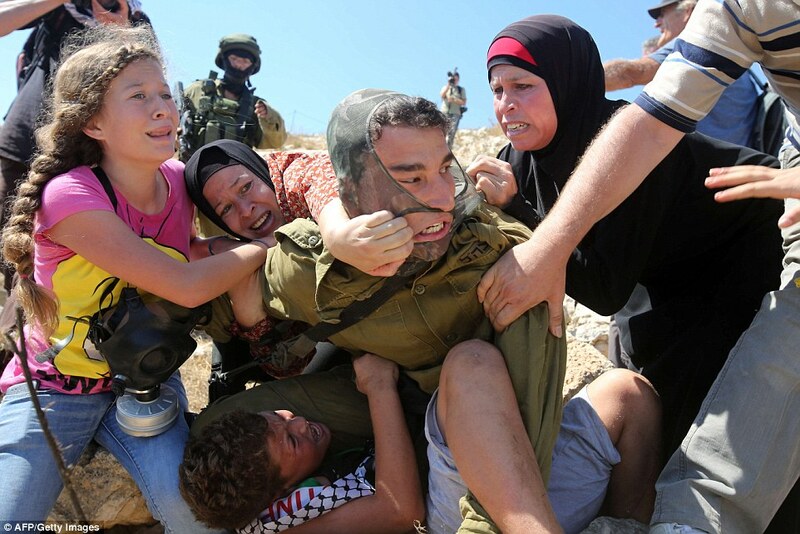 Photographs taken by Reuters and AFP show the soldier surrounded by women and children. 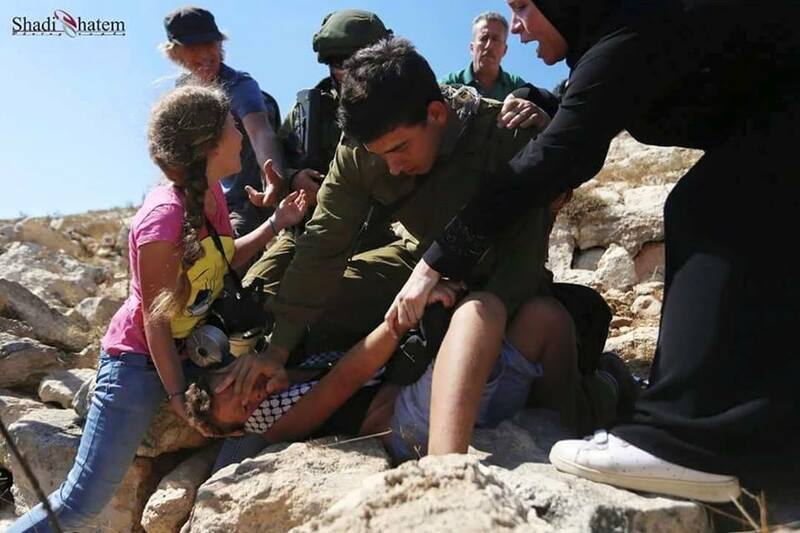 In one of the images, a young girl is seen biting his hand. 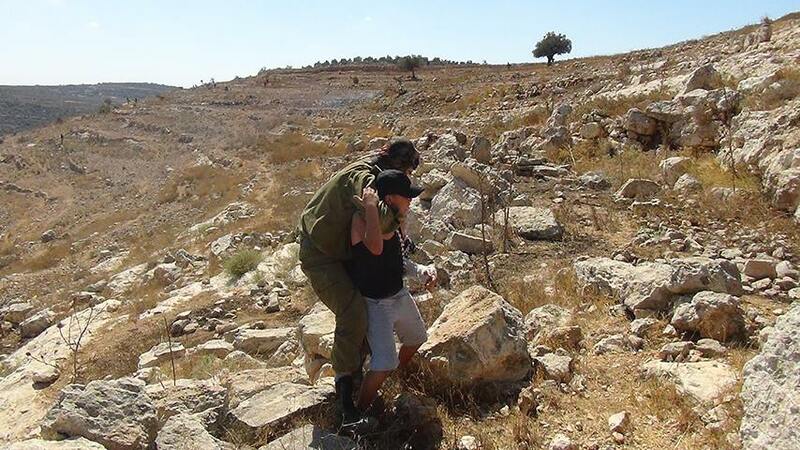 The soldier was lightly wounded as a result of the altercation. 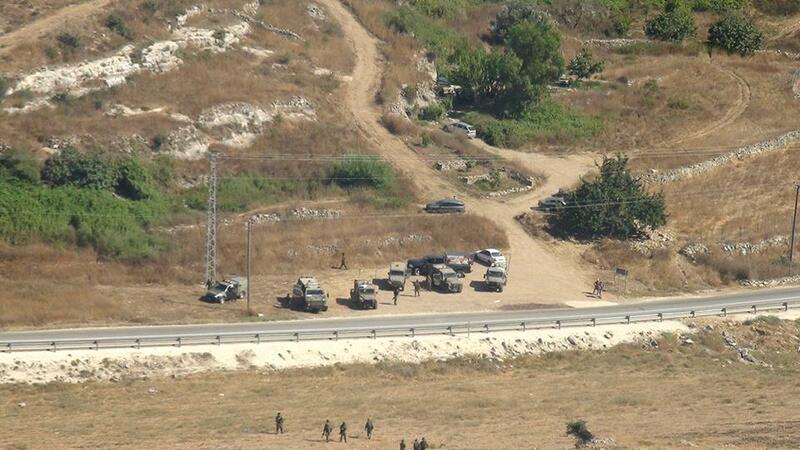 The commander in the area decided to release the minor. 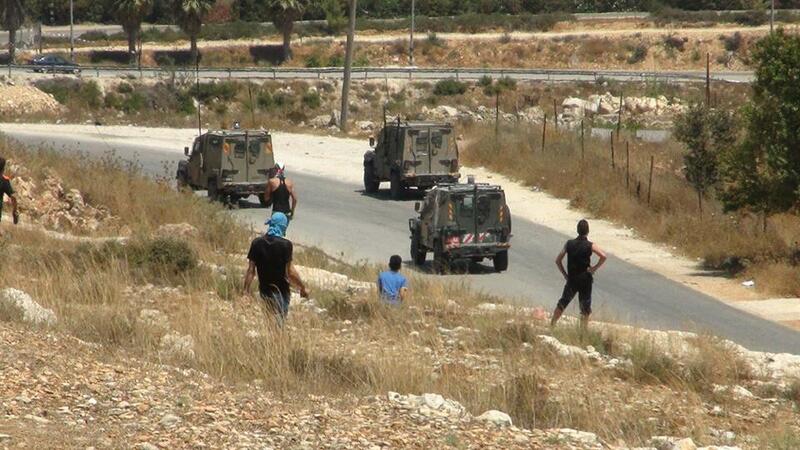 The army said that one other Palestinian was detained in Friday’s clashes, along with one foreign activist. 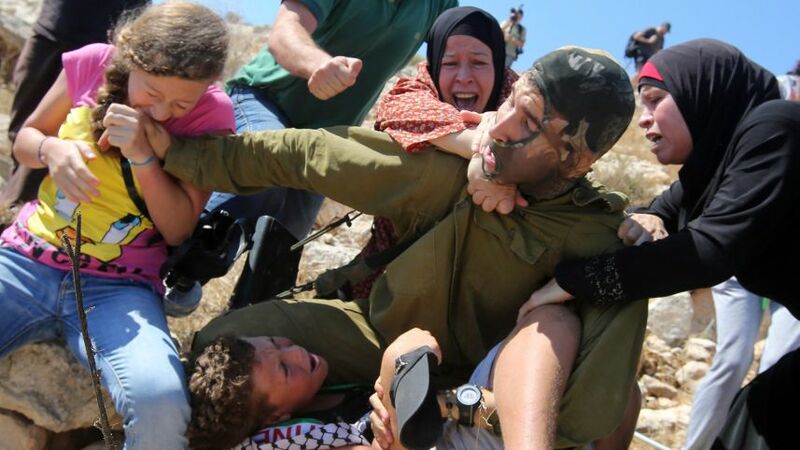 Activists who were at Friday’s protest said that the soldier used violence against the 12-year-old boy, whose arm was in a cast at the time of the attempted arrest. 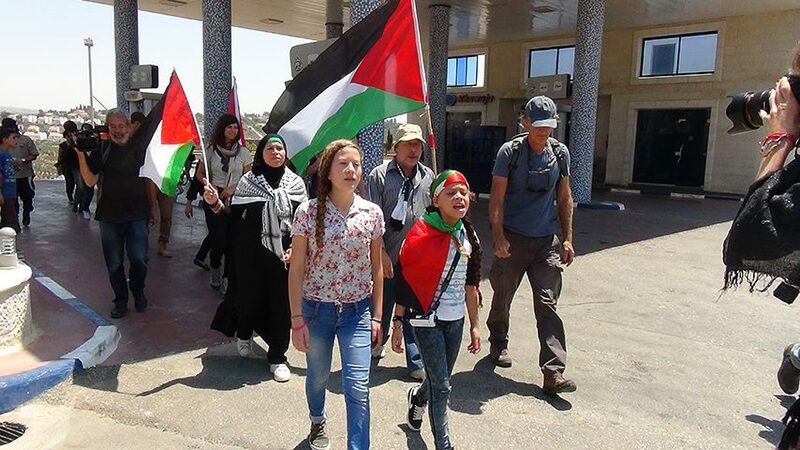 Jonathan Pollak, one of the activists present, said that the boy did not throw stones and that the IDF force, which was in an abandoned building before approaching to detain the boy, could see he was a minor. 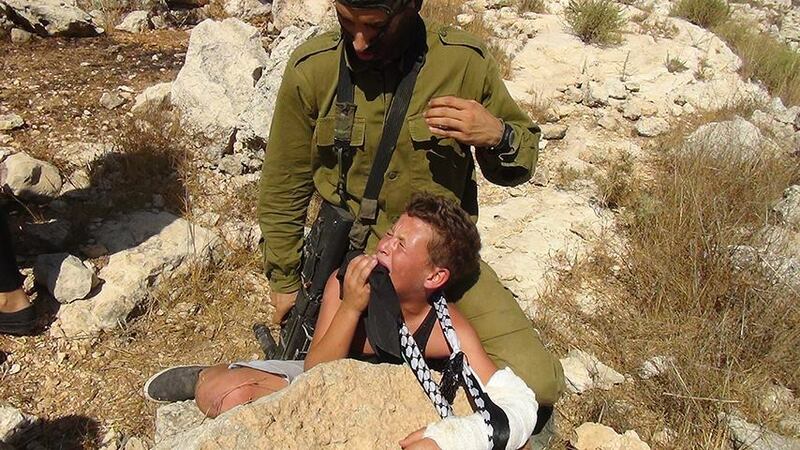 Pollak told Haaretz that the soldier pointed his gun at the boy when he was detaining him. 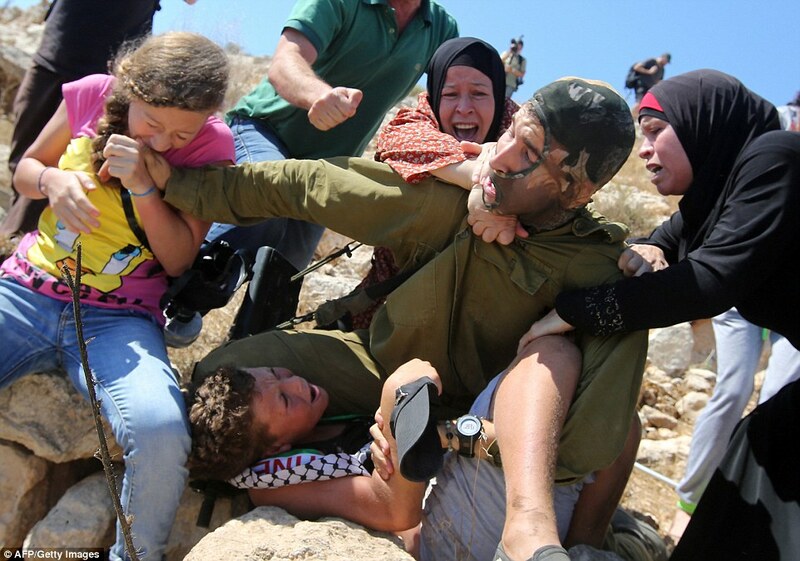 This is the remarkable moment a young girl and two women overpower an Israeli soldier who grappled a Palestinian boy with a broken arm to the floor at gunpoint. 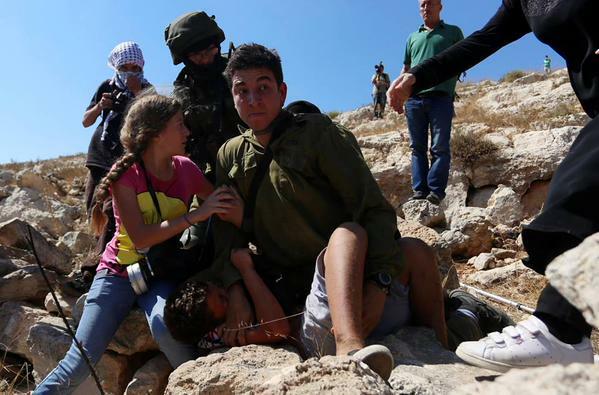 The soldier placed the boy in a headlock while armed with a machine gun during clashes between Israeli security forces and Palestinian protesters in the West Bank. 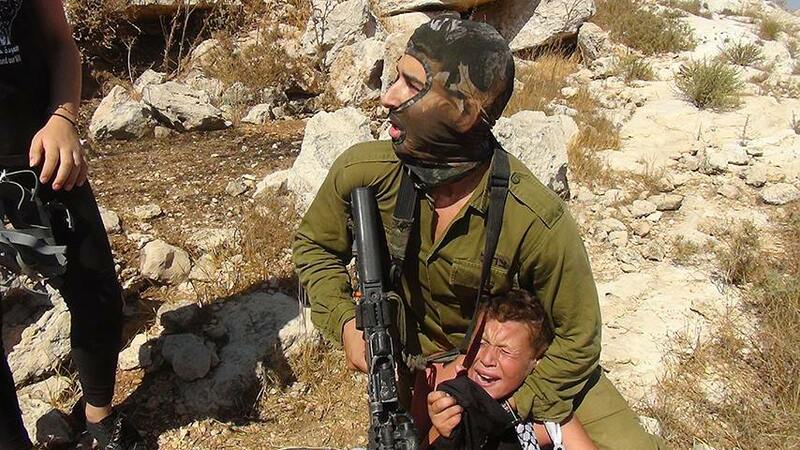 With terror etched on his face, the boy is powerless to move as the gunman towers over him, with the muzzle of his weapon just inches from his cheek. 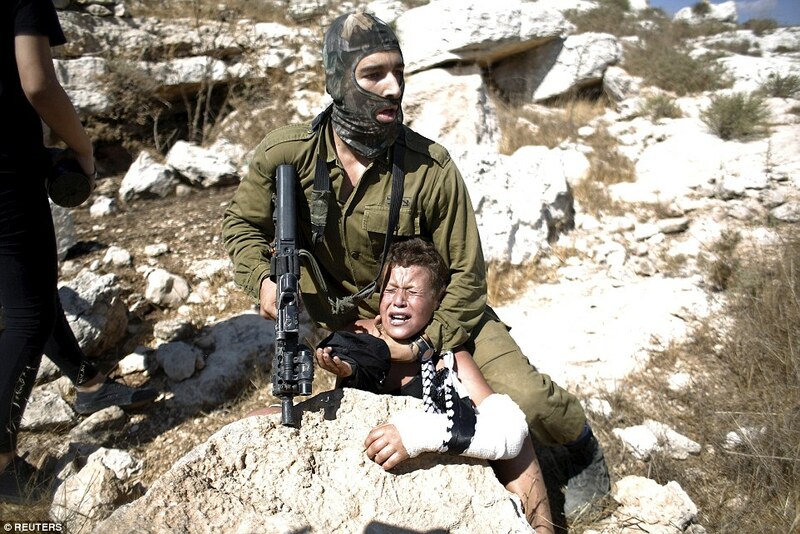 But as he pins the boy to a rock, the soldier suddenly finds himself ambushed by a young girl who forces the weapon from his grasp and bites his hand. 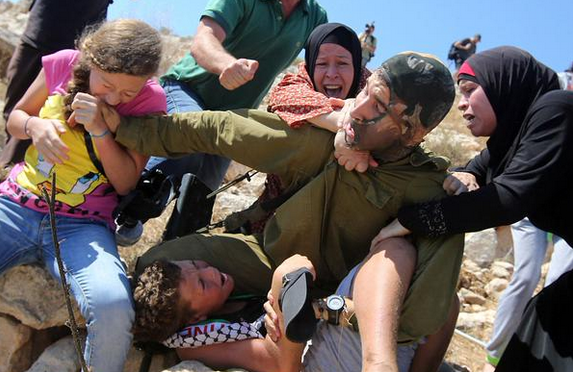 Meanwhile, two women claw at his balaclava-clad face and drag him off the youngster, who has his arm in a sling. 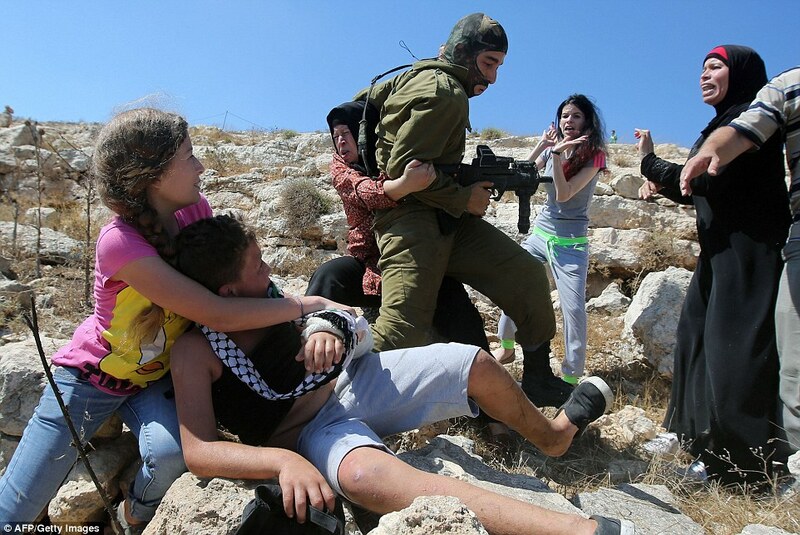 Eventually, the gunman flees the scene, leaving the young girl to cradle the terrified boy in her arms. 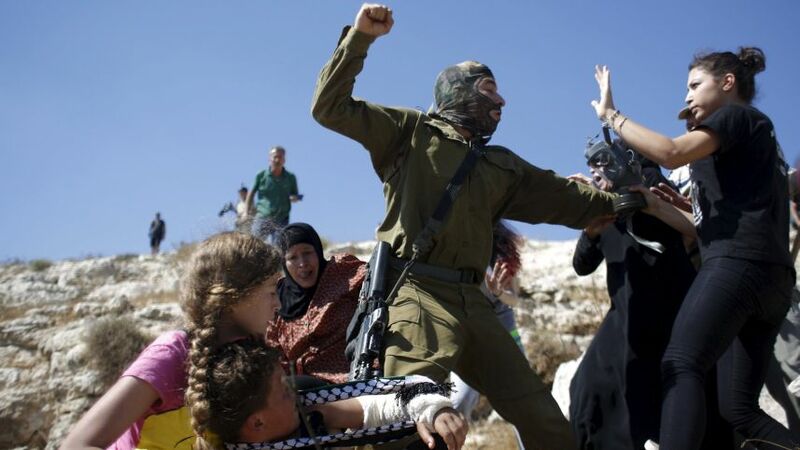 It is not clear what the boy had done to provoke the soldier into taking such drastic action, but it is not uncommon for protesters, and sometimes children, to hurl stones at security forces during demonstrations. 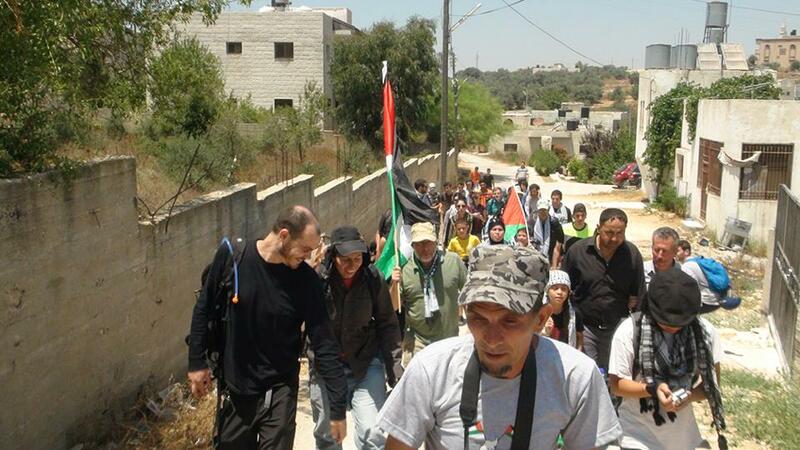 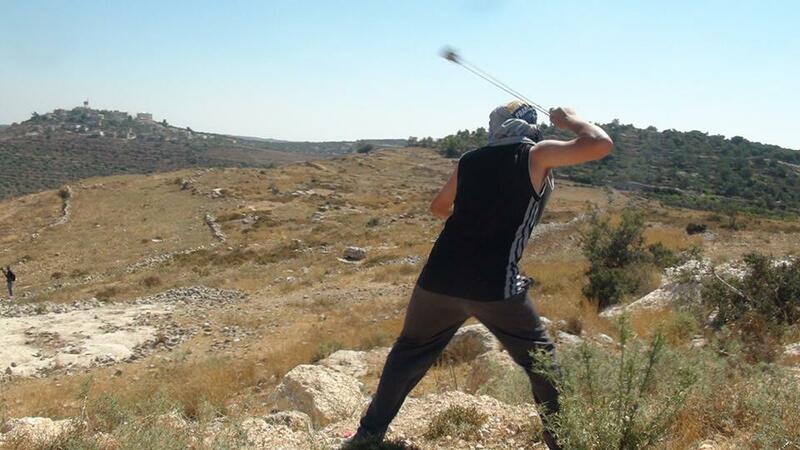 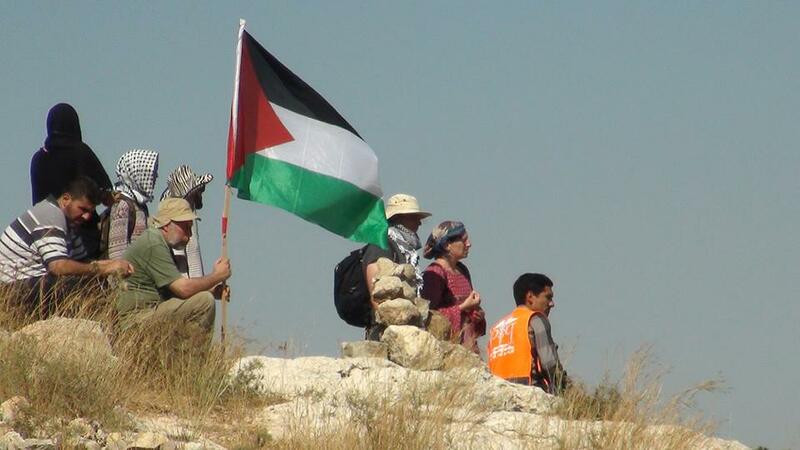 The clash happened in the village of Nabi Saleh, near Ramallah, during protests against Palestinian land confiscation to expand the nearby Jewish Hallamish settlement. 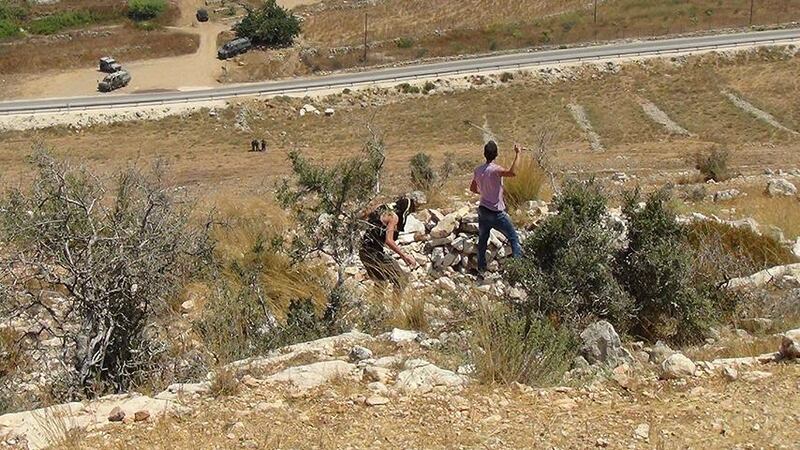 In another flashpoint, Palestinian protester hurled stones at Israeli army bulldozer during clashes which following a protest against Israeli settlements in Qadomem, Kofr Qadom village, near the the West Bank city of Nablus. 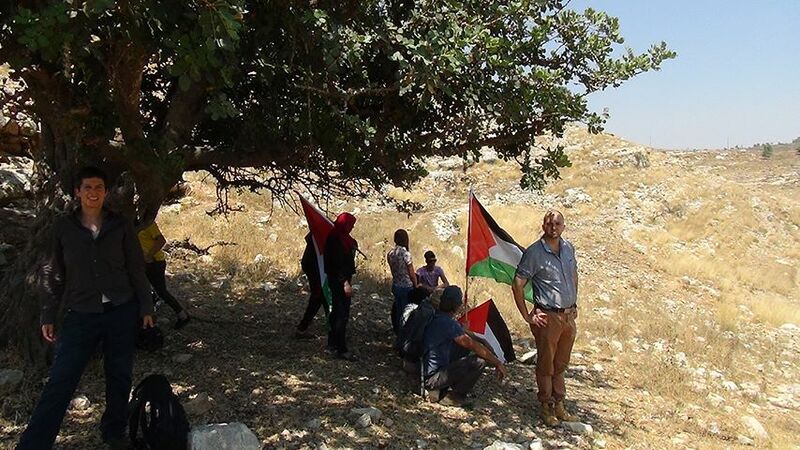 They come a day after the European Union’s outgoing envoy to the Palestinian territories said the 28-nation bloc was moving forward with measures against Jewish West Bank settlements. 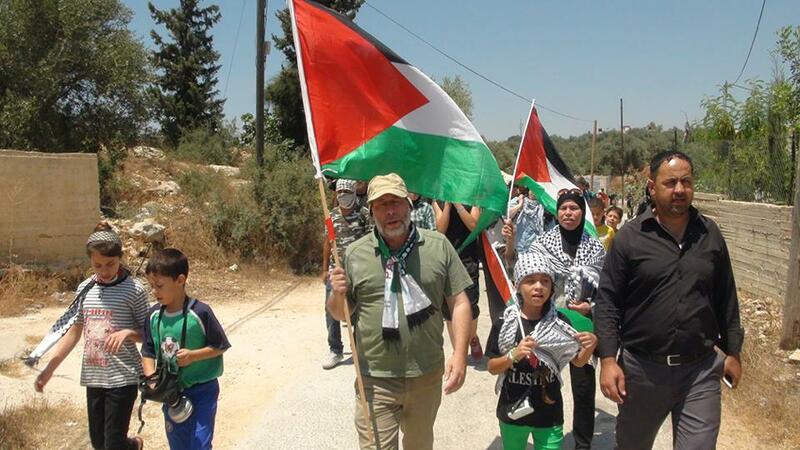 The envoy, John Gatt-Rutter, did not provide a timeframe. 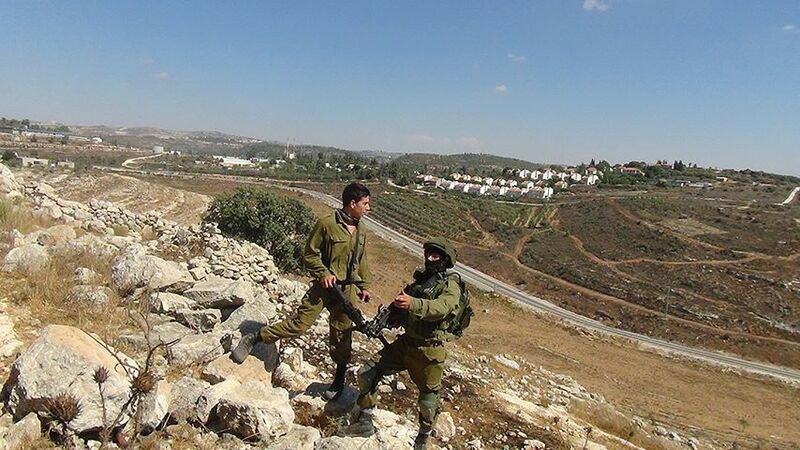 But his remarks to reporters underline European discontent with Israel’s continued expansion of settlements in territory that Palestinians want for a future state. 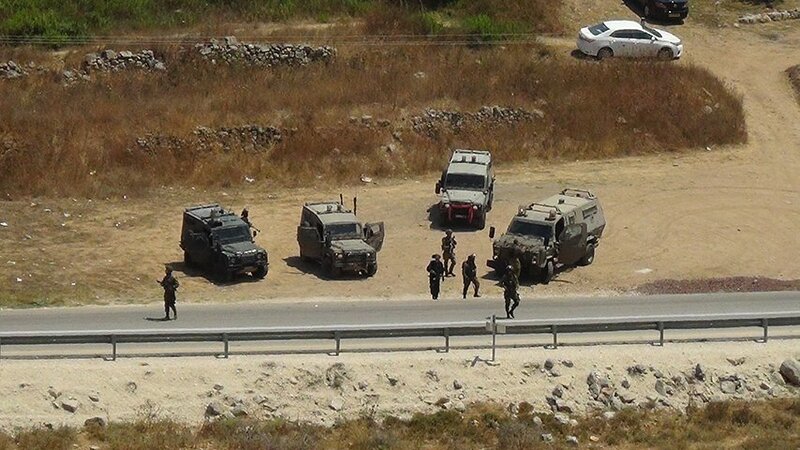 Israeli Occupation Forces invaded Nabi Saleh today and attempted to kidnap a 12 year old boy. 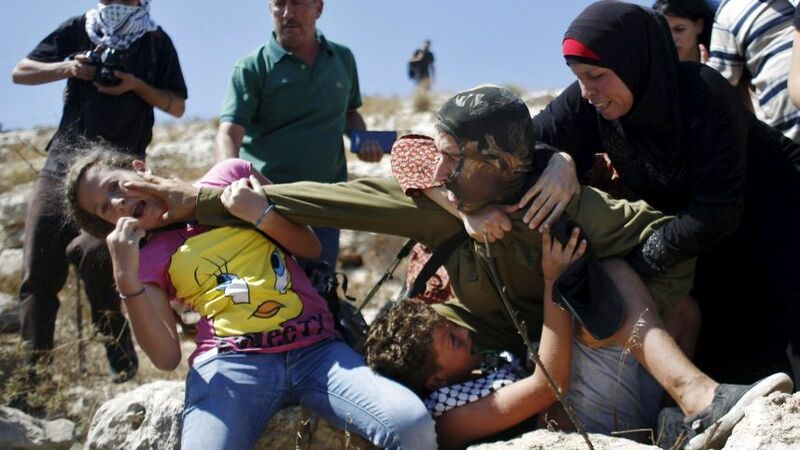 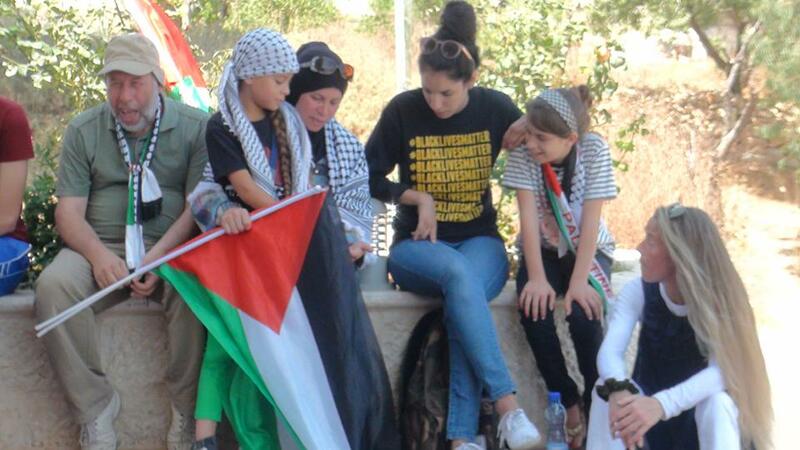 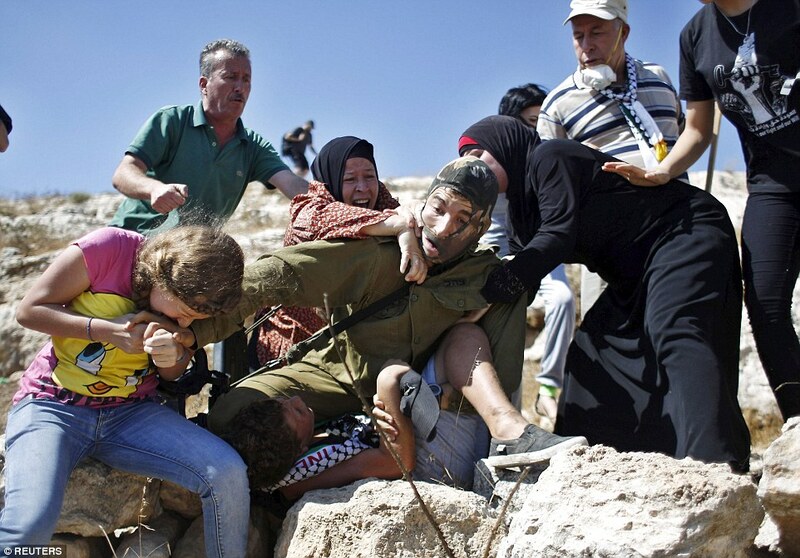 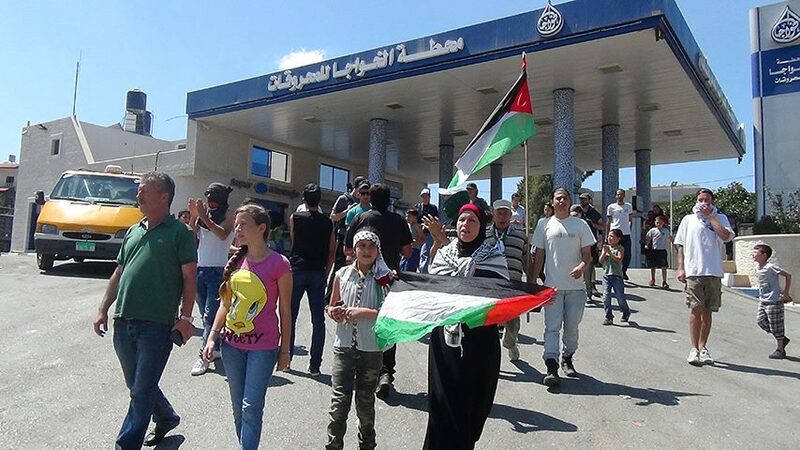 However, Palestinian women and girls managed to overpower the soldier and free the boy before he was taken away. 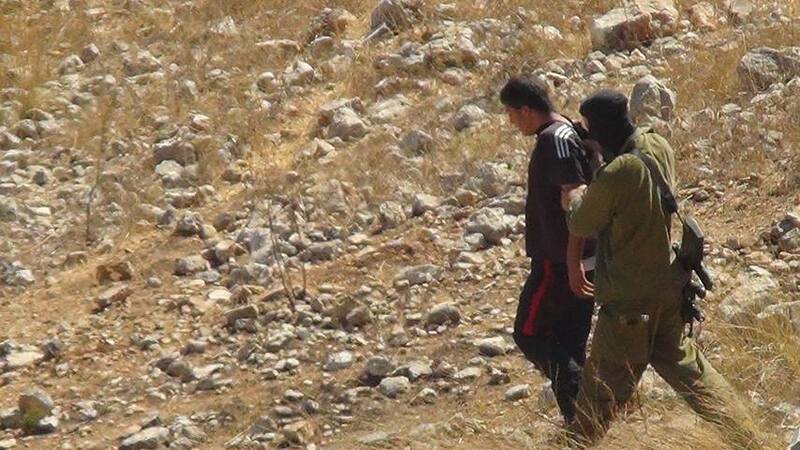 Israeli Occupation Forces also arrested an 18 year old Palestinian youth. 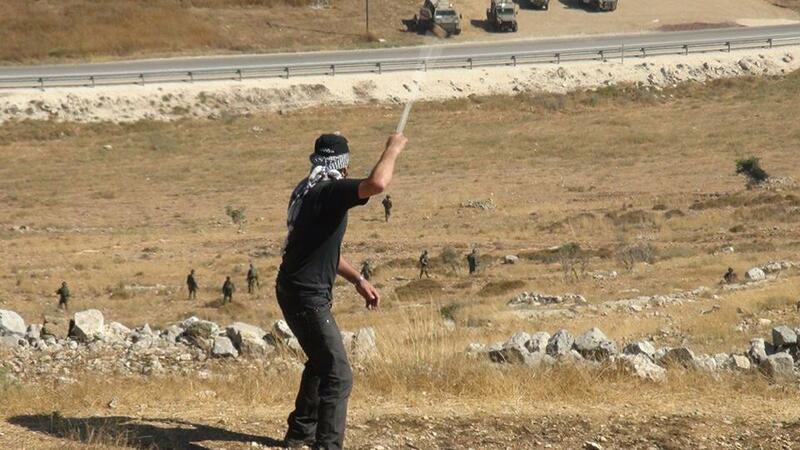 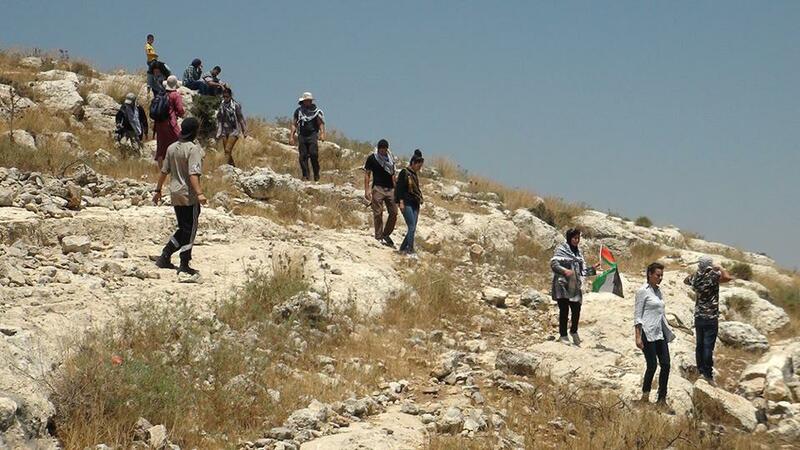 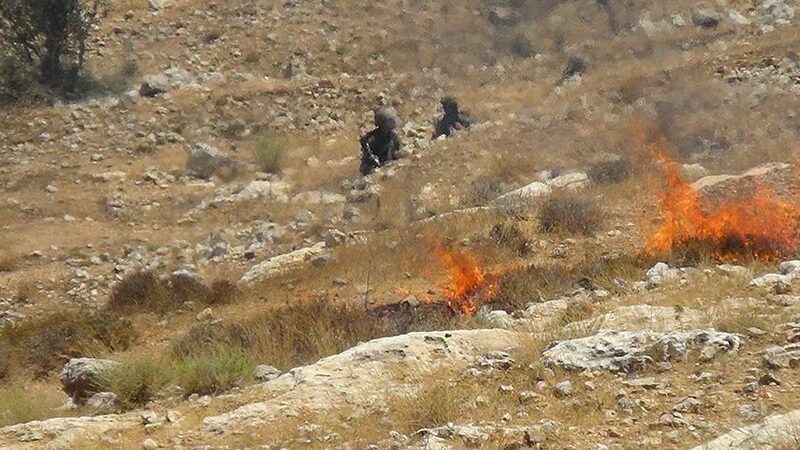 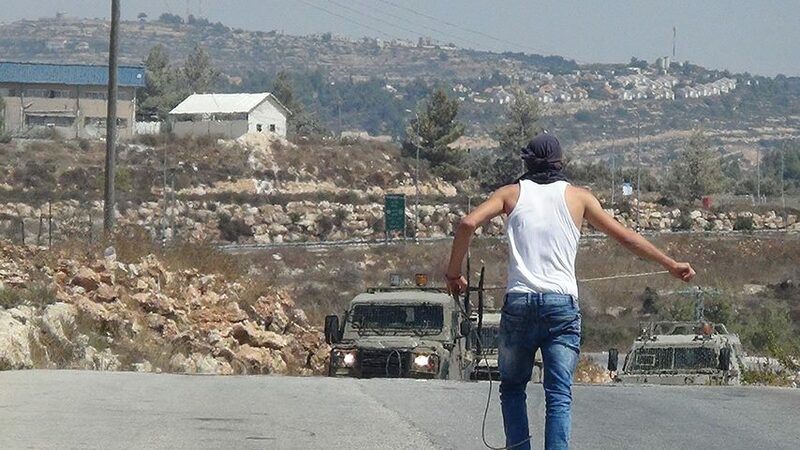 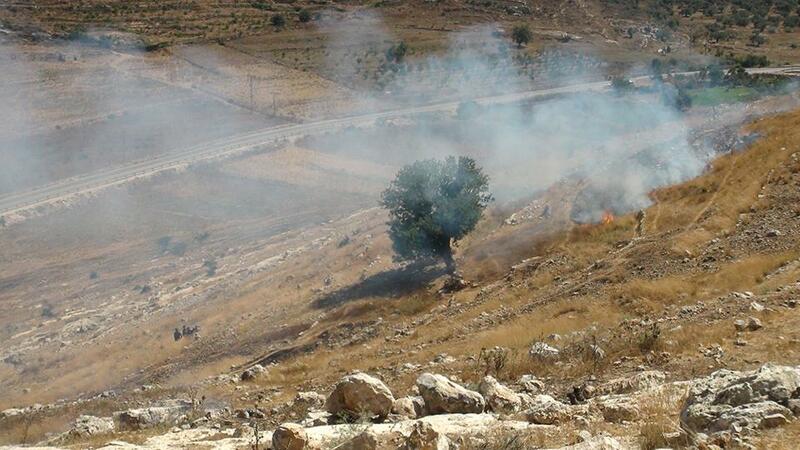 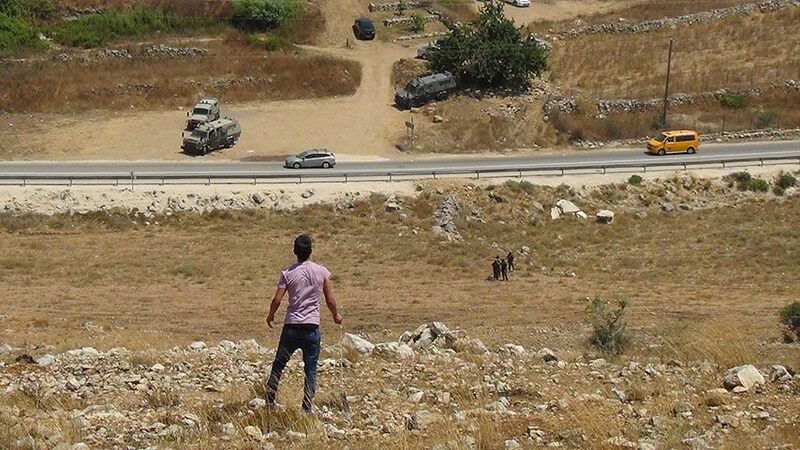 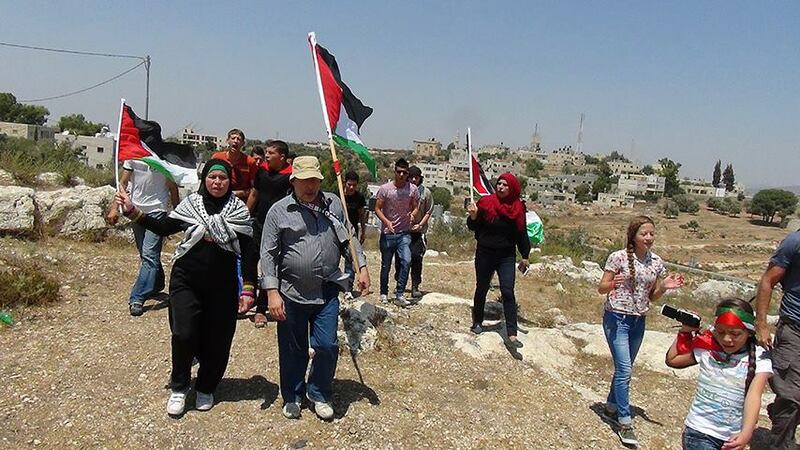 On Friday in Nabi Saleh, Israeli Occupation Forces opened fire with live ammunition during Friday protest against Israel’s occupation and land grabs. 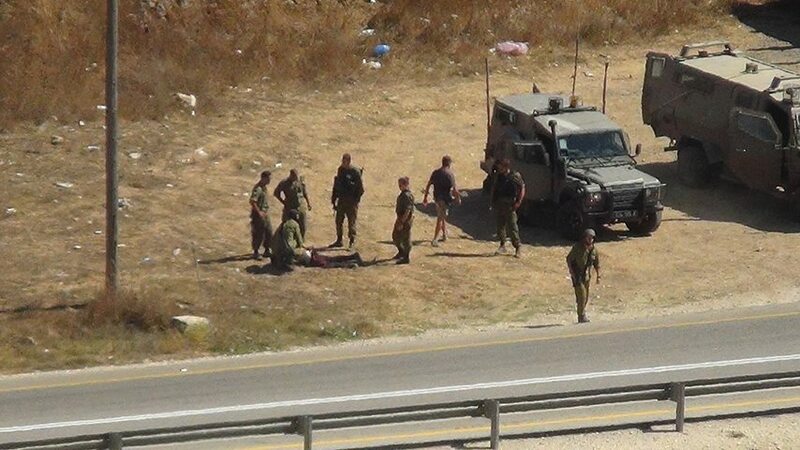 The IOF shot a 17 year old boy twice in the leg with live ammunition and a 27 year old man in the thigh with live ammunition. 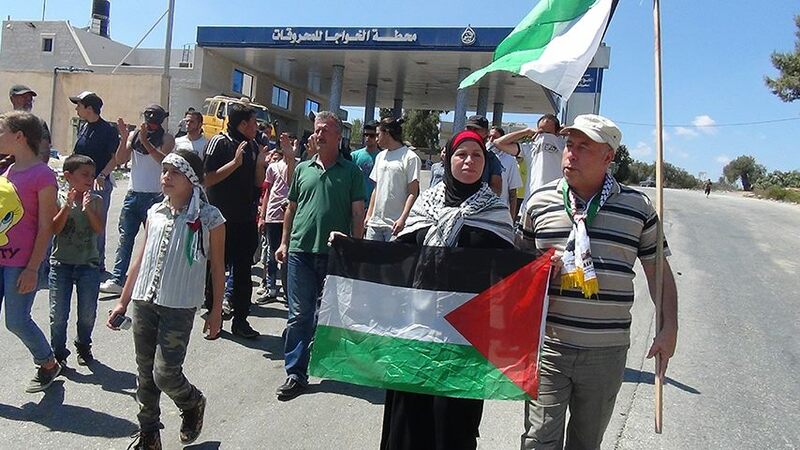 RAMALLAH (Ma’an) — Two Palestinians were shot and injured by Israeli forces Friday during a weekly demonstration in the occupied West Bank town of Nabi Saleh, witnesses said.Israeli forces had reportedly set an “ambush” near the path where demonstrators planned to walk, opening live fire as the marchers headed towards land confiscated by the neighboring Halamish settlement.During the incident, forces shot a 17-year-old with two live bullets. 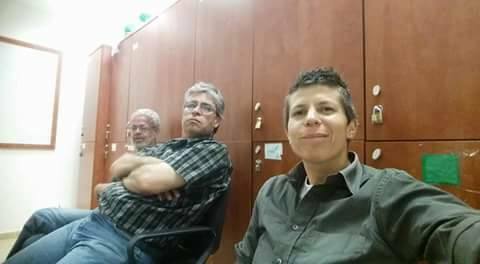 Witnesses say a bullet passed through one thigh, entering and settling in the teen’s other thigh, while a second bullet hit him in the back.A 27-year-old was also shot in the leg. 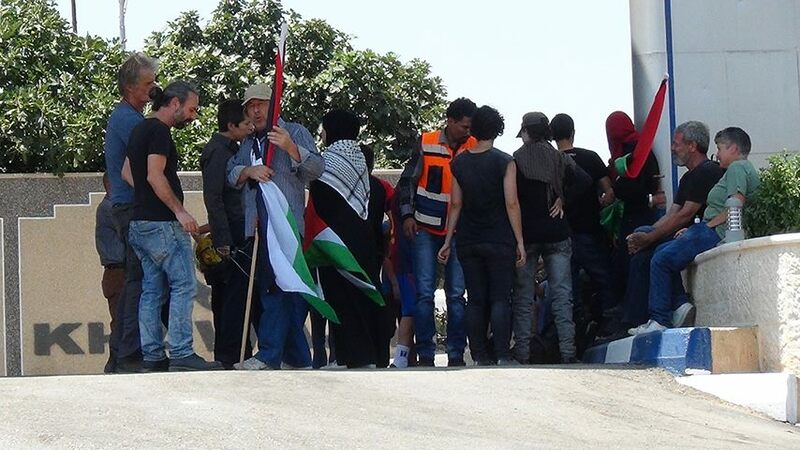 The injured demonstrators were taken to a hospital in Ramallah for treatment.Israeli soldiers attempted to prevent the ambulance carrying those injured from leaving the scene for a short period of time, witnesses added.An Israeli army spokesperson had no immediate information on the incident.Two Palestinians have died from live Israeli fire in the past few days, bringing the total number of fatalities at the hands of Israeli forces to 17 since the start of 2015.Rights groups have criticized Israel for disproportionate use of force against unarmed civilians during demonstrations.While crowd control weapons are intended to be non-lethal, many methods used by Israeli forces can cause death, severe injury, and damage to property, critics say.Residents of Nabi Saleh — similar to villages and towns across the occupied West Bank — have staged weekly demonstrations for years in protest of private land confiscated by Israeli authorities.Large portions of the Jewish-only Halamish settlement is built on land belonging to Nabi Saleh residents.